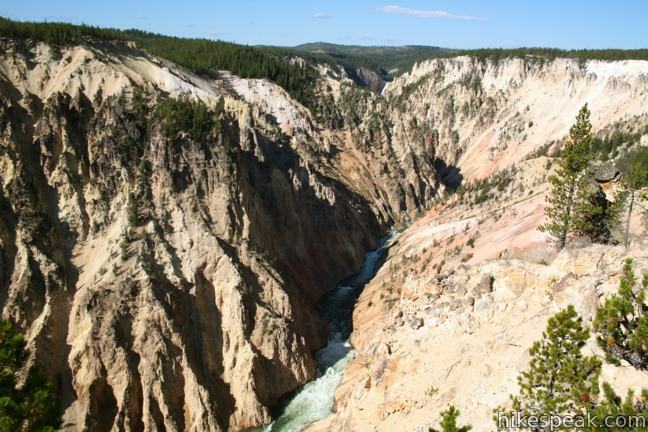 Starting with the Upper Falls of Yellowstone Falls, The Grand Canyon of the Yellowstone River runs northeast for over 20 miles, carving a 1,000-foot deep gash in the pine-covered landscape. The north and south rims are separated by a mere 3/4 of a mile, with treacherously steep canyon walls painted in oranges, yellows and reds. 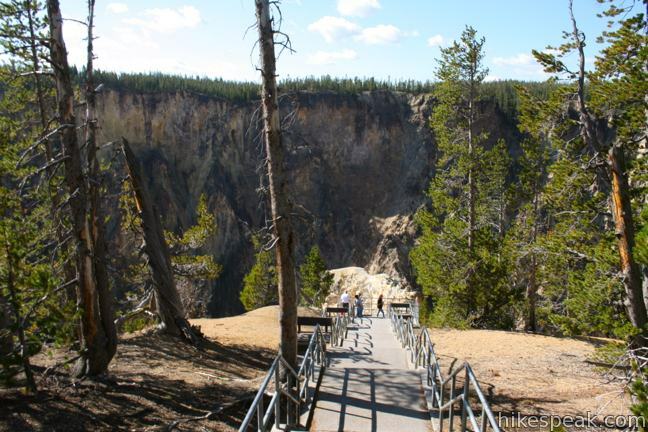 While you can only see a sliver of Yellowstone Falls from Inspiration Point, there is plenty to get inspired about. The point, which was originally named Promontory Point in 1878, juts out from the rest of the canyon wall to offer panoramic views up and down the canyon. 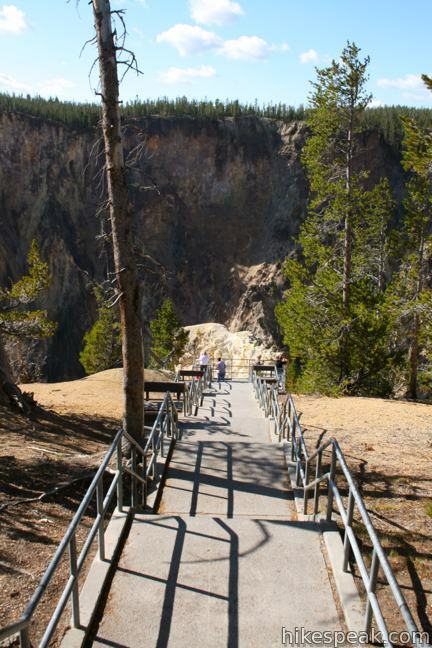 You can hike to Inspiration Point on North Rim Trail, or if you favor drive-right-up convenience, start from the parking area just behind the point and walk down a flight of stairs to inspiring views. It is less than a tenth of a mile round trip to Inspiration Point with fifty feet of elevation change. The place where I obtained the best and most terrible view of the canyon was a narrow projecting point situated two to three miles below the lower fall. Standing there or rather lying there for greater safety, I thought how utterly impossible it would be to describe to another the sensations inspired by such a presence. As I took in the scene, I realized my own littleness, my helplessness, my dread exposure to destruction, my inability to cope with or even comprehend the mighty architecture of nature. At that time, General Washburn’s men would have enjoyed even broader views. About a century later, in 1975, an earthquake measuring 6.1 on the Richter scale severed off a massive section of Inspiration Point. The former end of the point, including 100 feet of the initial viewing platform, crashed into the Yellowstone River far below. The observation area now stops behind the current tip of Inspiration Point, which geologists have determined to be unstable. Stay behind the fence and enjoy the safe, slightly diminished panorama. Even from today’s vantage point, there is an expansive view of the deep rugged canyon. 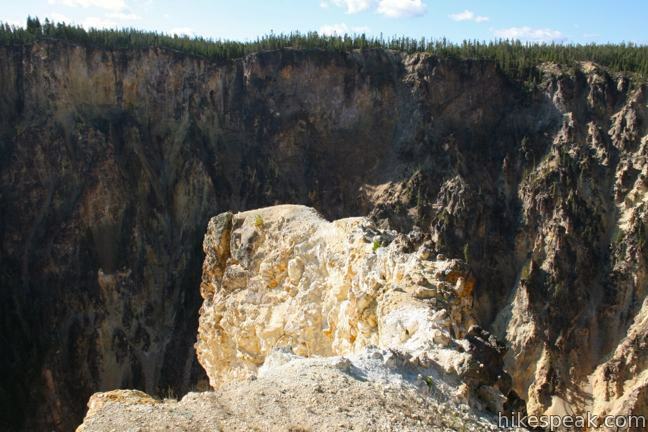 Earthquakes and tremors continue to reshape this area and are responsible for several landslides visible along the Grand Canyon of the Yellowstone. 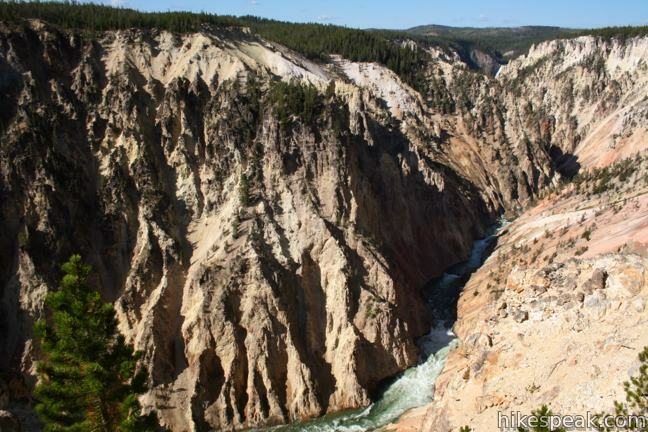 Look down at the whitewater far below the point or up the canyon toward a sliver of Lower Falls flanked by bare yellow walls. It’s an inspiring sight! 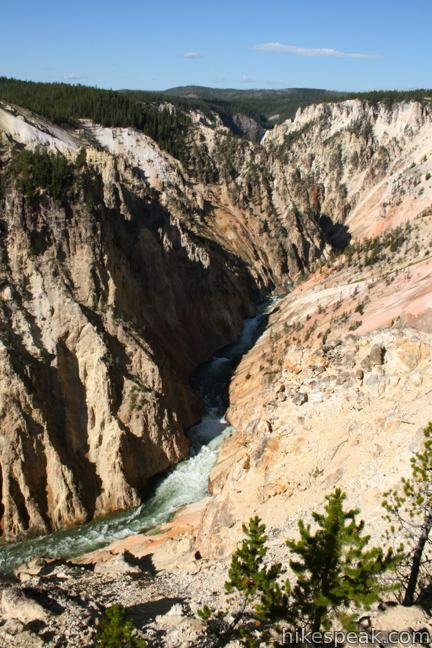 To get more views of the Grand Canyon of the Yellowstone River, you can head west from Inspiration Point on North Rim Trail toward prime viewpoints like Grand View Point, Osprey Point, and Lookout Point. 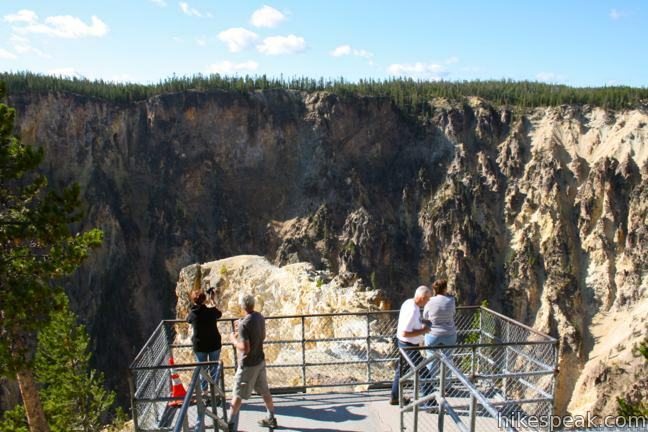 Yellowstone National Park has an entrance fee, but no permit is required to visit Inspiration Point on the North Rim of the Grand Canyon of the Yellowstone River, so get out and enjoy! My girlfriend and I are thinking of using this trail. Where exactly is it? We plan on staying at the Madison campground or the Bridge Ba (likely Madison). If a far distance, are we able to drive? 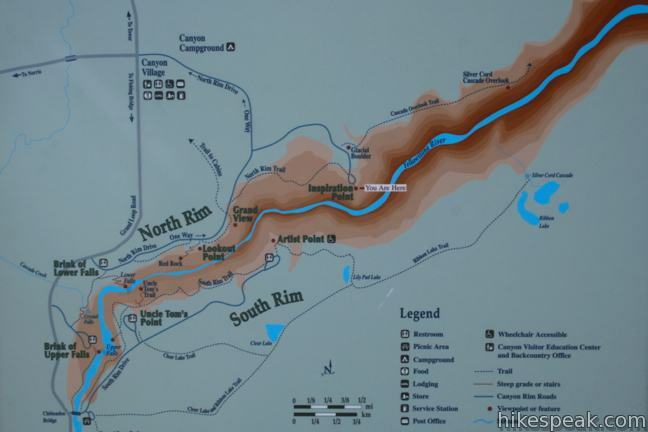 If you have not gone yet, stay at Canyon Campground…it is very close to the North Rim Trail. how deep is water basin at inspiration point? does anyone know?